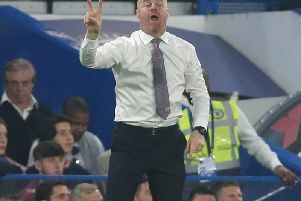 Burnley will fancy their chances of progressing to the play-off round of the Europa League after keeping a clean sheet and coming through unscathed at the Fatih Terim Stadium against Turkish Superlig club Istanbul Basaksehir. Sean Dyche made six changes from the side which advanced past Aberdeen last Thursday night, and utilised players with good European experience, handing Joe Hart his debut, and giving Jon Walters only his second start for the club. Basaksehir started well, as Burnley endured a nervy opening, and former Juventus man Eljero Elia couldn't get a good contact on Edin Visca's ball in ibn an early scare. Burnley began to enjoy more possession, and Jon Walters, making only his second start for the club, rose to flick Phil Bardsley's ball into Ashley Barnes' path, but just got too much on it. However, former Newcastle United midfielder Emre Belozoglu - now 38 - began to show his class, picking his passes well, and one dangerous ball flew right across Burnley's goal with no takers. Moments later, Visca pulled a ball back across the area, but again, there was no one in an orange shirt to take advantage. Burnley, as you would expect, were a threat from a rare set piece as Bardsley's dead ball was headed on by Ben Mee, but James Tarkowski delayed his shot slightly, and Mahmut Tekdemir cleared. Joe Hart, on his debut, had to be alert to get his hands to a stinging cross shot from right back Junior Caicara, who beat Charlie Taylor on the outside, before the peripheral Johann Berg Gudmundsson slashed a volley over the angle as Jack Cork headed on a Walters cross. Visca continued to be a threat down the right, and Emre played him in, with another low centre cleared, forcing a corner, from which Manuel da Costa's header forced another stop from Hart. Tekdemir was dropping into the back from central midfield as the centre backs split, allowing Gael Clichy to come inside and influence play, as well as get high up the pitch, with Emre pulling the strings, and the former Turkey international had a fierce strike blocked by Tarkowski, as the Clarets held out under a good spell of home pressure before the break. The second half saw little attacking intent from Burnley - a case of what we have, we hold, in a very professional performance, showing some nous in continental competition. Barnes, who had eight touches in the first half as he ploughed a lone furrow, was booked early into the second half for delaying a free kick. Hendrick was closed down by the keeper Mert Gunok from a narrow angle as he tried to flick the ball back to Tarkowsi after the ball fell kindly for the Clarets in the area. On the hour, substitute Molis Jojic fired into the side netting at near post from Riad Bajic's flick on, before Sam Vokes was introduced for Gudmundsson, looking to emulate his first leg goal in the last round at Aberdeen. Hart was booked with quarter of the game to go for taking his time with a free kick, as Burnley looked to slow the game down, as the game petered out to a draw, with the 75-cap England keeper well protected, Phil Bardsley deflecting a late Emre corner onto the stanchion and behind. Burnley: Hart; Bardsley, Tarkowski, Mee, Taylor; Walters, Westwood, Cork, Gudmundsson (Vokes 60); Hendrick; Barnes (Lennon 77). Subs: Legzdins, Long, Gibson, Lowton, Ward. Istanbul Besaksahir: Gunok; Caicara, da Costa, Epureanu, Clichy; Emre, Tekdemir (Jojic); Elia (Frei 83), Kahveci, Visca; Bajic (Napoleoni 89). Subs: Babacan, Attamah, Ucar, Inler.